Newly-published research has revealed that Sheffield has the highest household spend on outdoor equipment in the country, which is good news for retailers in the area. The city also has more than 200 outdoor equipment businesses, including the likes of Planet X, which sells over 10,000 products worldwide and is, the press statement says, the second-biggest bike assembler in the UK.. Sheffield City Council says that means the city is the undisputed outdoor capital city of the UK, though some might, er, dispute that. The news is being trumpeted to mark the news that Sheffield’s hosting the 2015 European Outdoor Summit (EOS), having been selected by the Outdoor Industries Association (OIA). The city will also play host to the International Adventure Conference 2015. Andrew Denton, Chief Executive of the OIA, said: “The Outdoor Industries Association is excited about hosting EOS 2015 in Sheffield. The city is at the heart of the UK’s outdoor scene and has a bold ambition around outdoor recreation – it’s the perfect location." Councillor Leigh Bramall, Sheffield City Council’s cabinet member for business, skills and development, said: “This is the start of something really exciting for our city. As a Sheffielder, I know that the city and surrounding region is home to some of the most spectacular hills, valleys and rivers in the country, which play host to tremendous opportunities for outdoor pursuits. “But to have this excellence confirmed by an independent study, carried out by the Sport Industry Research Centre, is fantastic, and proves that now is the time to start building upon our reputation internationally. 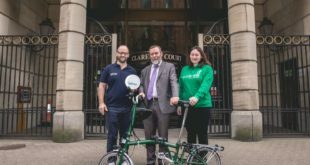 “It is crucial that we capitalise upon this research and work with stakeholders across all sectors to together position Sheffield as the outdoor capital of the UK, which will bring – and is already bringing – huge financial benefits." The press statement goes on: "The Sheffield City Council-commissioned study, carried out by the Sport Industry Research Centre at Sheffield Hallam University, has found that outdoor recreation in Sheffield generates more than £53m in economic output a year, in addition to engaging people in outdoor activity and generating significant health benefits. The study revealed that Sheffield’s passion for the outdoors generates a higher than average expenditure on trips and outdoor gear, with total consumer spending on the outdoors estimated at being around £93m a year. An online survey carried out as part of the research found that the best thing about living in Sheffield is that it is the “best of both worlds” – a combination of urban living and access to the outdoors. A huge 66 per cent of people in Sheffield take part in outdoor recreation overall – more than six per cent above the national average of 59 per cent. An audit showed that in terms of participation rates and economic importance, Sheffield is synonymous with climbing, cycling, walking and running. In addition to being the climbing capital of the UK, with more than 10,000 Sheffield-based climbers and the highest number of climbing businesses compared to neighbouring major UK cities, Sheffield has more than 1,200 members in the Sheffield Ramblers and 26 running clubs, has a strong fell running scene, is nationally renowned for mountain biking and is home to the country’s only city centre mountain biking facility, at Parkwood Springs. Dr Larissa Davies Reader in Sport Management in Sheffield Hallam’s Sport Industry Research Centre, said: "In the year when the Tour de France came to South Yorkshire, it is really pleasing to see Sheffielders participating so enthusiastically in a wide range of outdoor sports. Sheffield City Council is now setting up a joint venture with key partners such as the National Trust to develop an Outdoor Economy Strategy for the city. The strategy will be launched at next year’s EOS and will seek to establish Sheffield’s outdoor assets as a key part of the city’s identity and maximise their economic potential."